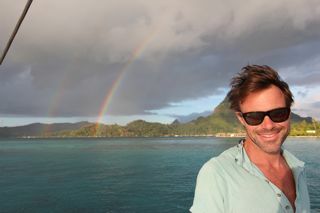 Any place where you arrive and there is a double rainbow has to be special. and bora bora is definitely a special place. It’s what everyone imagines to be a perfect tropical island. At the center is an old sunken volcano, surrounded by “motu” or sandy low islands, and then a ring of coral protects the harbor. This inner harbour has virtually no waves compared to the open ocean waves and makes it perfect for snorkeling. Today we awoke around seven and headed towards the manta ray gardens. Gwen had just woken up and the idea of searching for “giant manta rays” wasn’t really exciting her, but she was a good sport and plunged in. Ash although a good swimmer for four, held onto don’s neck and looked over his shoulder. Underwater, the coral spread out like a colourful blanket. Fish surrounded us on all sides and then we saw the rays. They were amazing, 3 meters across, gliding effortlessly all around us. We even saw a black-tipped reef shark. Lunch at the the four seasons. All in all a good day. There’s talk of pirates tonight. Apparently, a friend of Alain had some things removed from his boat one night at this anchorage. We can see atiny house on the motu about a Km away. Alain loves to scare me by talking about three meter long sharks and i suspect he’s enjoying watching me squirm with the idea of people boarding the boat in the middle of the night. All the same, he did lock the dingy motor to the railing and bring in the deep sea fishing rode. I guess there must be some truth to it. Tomorrow Don wants to go swimming with sharks. The plan is to attempt to feed them some of an uncooked leg of lamb. Hopefully they like that. Does this sound like a good plan? Not so sure about this??? 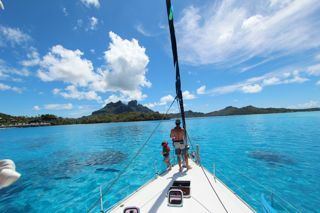 I am SO happy to read that Bora Bora is amazing! I remember day-dreaming about it in Grade 7 after seeing it on Lifestyles of the Rich & Famous. Lucy Oh (who had also seen the episode) and I had a great plan – it went something like “we’ll both make millions of dollars & live there”. I have often thought about it since, with a part of me wondering if it is really as magical as it seemed. I am really enjoying reading about your adventure / odyssey, and wish you & the family happy & safe travels. And after living in a country where shark-attacks were fairly common, I’d recommend AGAINST the raw lamb idea.